It may be small, but the iAudio D2 sure packs a lot into its slight frame. Not only does this compact gizmo play audio and video files, but it also features an FM tuner and SD/MMC card reader slot. At just 78mm wide, the iAudio D2 is the very definition of pocket-sized, while its smart, dark grey and silver styling is robust and highly attractive. The 2.5in LCD has a 320 x 240 (QVGA) resolution and it's a touchscreen affair. You get a little plastic stylus, which you can use to navigate menus. It also acts as a clever kickstand to keep the unit propped up. On board is 2GB of Flash memory and video file compatibility is limited to MPEG4 AVI - all other types have to be converted into this format using the supplied JetAudio software. This software is well designed, although it refused to convert our WMV8 file. According to the manual, the unit is also supposed to play WMV9 files without conversion, but in our test they just refused to play. On the audio side, it plays the usual formats such as MP3, WMA and WAV, plus the lesser known FLAC, OGG and APE files. And when playing them back, there's a wide choice of audio tweaks to use, including BBE, Mach3Bass, MP Enhance, 3D Surround and five sound presets. Also onboard are voice, radio and line-in audio recording, plus text and JPEG viewers. It's also worth mentioning the amazing 52hr audio-only battery life, which means you shouldn't run out of juice at a crucial moment. The user interface is welcoming and clearly arranged, using bright colours, overlaid pop-up menus and jazzy icons. But the less dextrous among you may find the tiny stylus a little fiddly to use at times. Despite the 2.5in screen's inevitable size restrictions, the pictures on offer are very enjoyable indeed, looking remarkably rich and vibrant thanks in particular to the strong colour saturation. What's more, files play back smoothly with a pleasing lack of noise, and images retain a high level of sharpness, even when detail has been stripped out during the conversion process to suit the QVGA screen. Our test JPEG files also look crisp and colourful, but audio playback is the D2's trump card. MP3 files sound loud, detailed and punchy, especially when enhanced using the unusually effective EQ modes that add a lot of energy to the mix. This top-drawer sound performance isn't surprising either, given that it fires an impressive 74mW of audio power down the headphone wire. 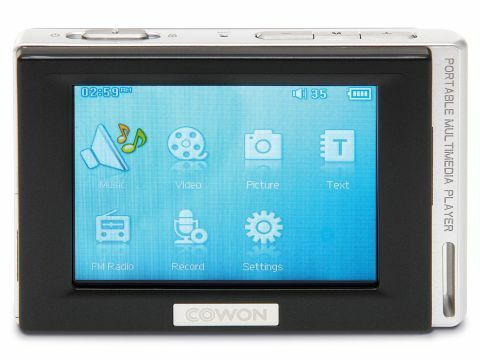 Cowon puts the icing on the cake by providing a crisp and stable FM radio reception. While the D2 may lack the wow factor of some bigger and better specified players, as Flash-based PMPs go this is one of the best, and at just £120 there's no excuse not to buy one.